For a while now I’ve been contemplating making something that would possibly make my life a little easier. 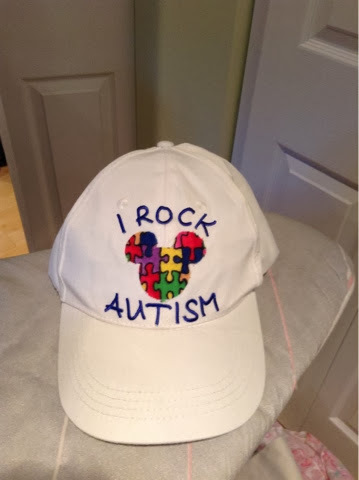 I’ve had enough meltdowns on outings with my ASD kids to know I wanted to do something to indicate we are an Autism family. I also wanted it to be an item I could keep in my car or diaper bag and pull out if we had an unplanned excursion. (Those are the kind that prompt the most meltdowns). There are great t-shirts out there, but those would be wearable once and then need to be washed. I would also have to get it back into the bag/car after it was washed. (Which might be a challenge since I’ve forgotten to restock diapers for the baby from time to time). 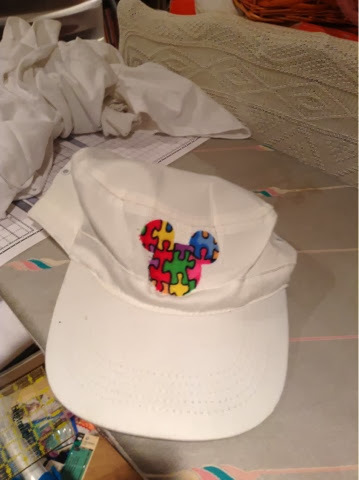 I also wanted to have whatever I made available for daily use on our vacation to Disney World. 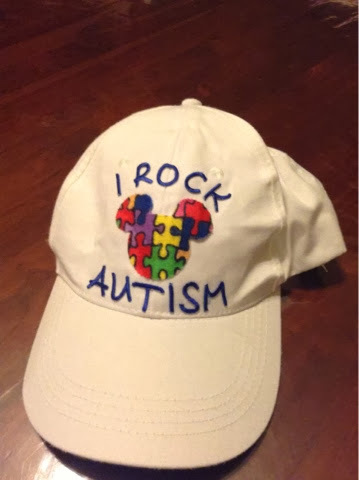 I thought about creating vests out of lightweight material, and I may still do that, but another crafter on the fabric store suggested hats to me. This made total sense to me since I need to have all the kids pack hats for the Florida sun anyway. 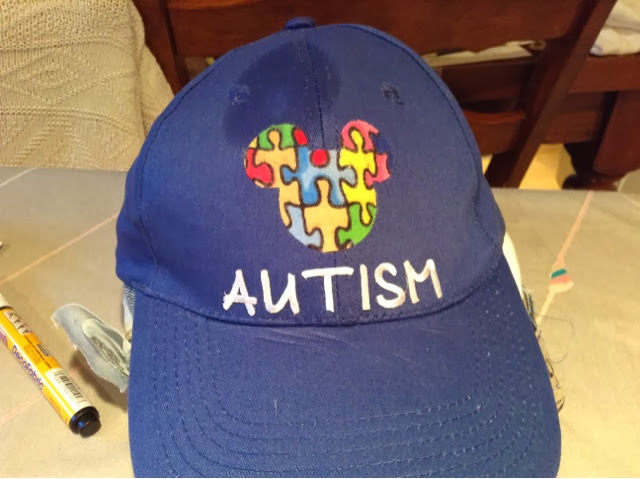 I checked out the store and they both painters caps and plain baseball caps. 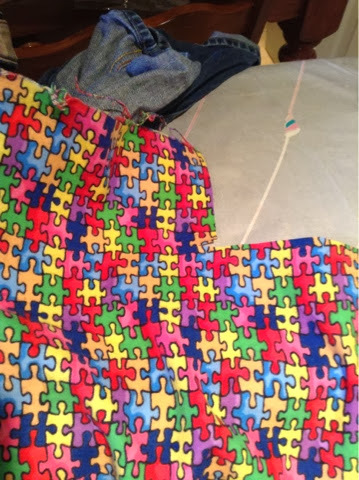 I found this awesome puzzle piece flannel in the fabric store. 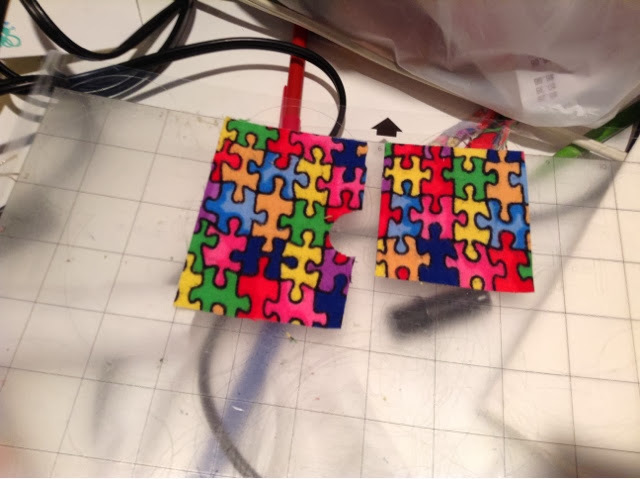 Multi-colored puzzle pieces are a symbol for Autism, so this was perfect for my needs. I used my silhouette cameo with a fabric blade and iron-on interfacing. Flannel is thicker, so I found the canvas setting worked well. I used a downloaded Mickey head and turned it into a cut file using my silhouette software. I cut three from the fabric. You can’t really see two cut Mickeys with this photo, but they were there. 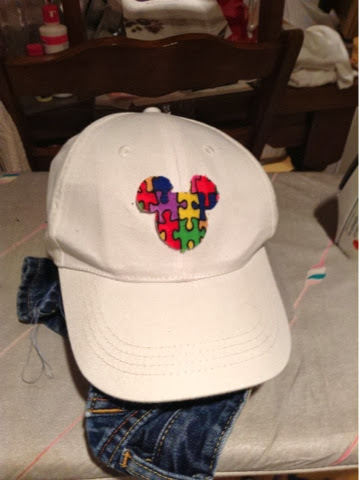 To iron on the Mickey head, I needed to support the inside of the ball cap. I first used a wadded up pair of jeans I was repairing. It didn’t give enough support. Then I used a folded towel which worked much better. I looked high and low to find the right scale letters for my hats. I also bought a fabric paint pen. The fabric paint pen didn’t give me the look I wanted, and I was lucky enough to find what I needed at Hobby Lobby. They are JOY brand Baby Monogram Letters and Numbers. You can find them here. I laid out the letters first on the hat (which was a bit tricky), then figuring out where the T needed to be more or less centered, I started ironing down letters. I found it easiest to keep working in one direction with the letters since the iron had heated up the fabric and made the glue on the letters start to warm up a little. By the way, the dark spot you see above the Mickey head in the picture below? It was wet there where I had wiped away the fabric paint. The fabric paint really didn’t work as well, though I don’t have a picture to prove it to you. For the record, the painters cap really didn’t have enough room to use any letters, so I left it plain. The white baseball cap with a bit more embellishment. I was overall pleased with the end result. 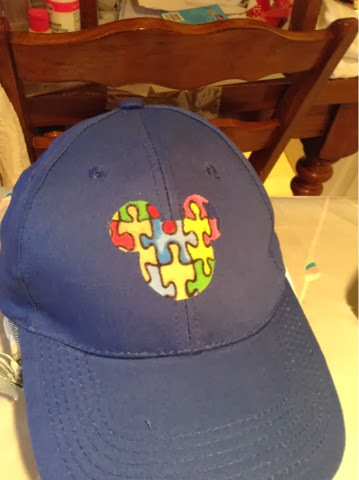 I had the kids wear the caps to the Disney and instead of glares, I got smiles and patience. Acroboy wore his cap and sat front and center at Turtle Talk With Crush and he was chosen to talk to Crush. (Boy! Was he excited!). I’m not sure if it was because of the hat or where he had chosen to sit, but he was thrilled none-the-less. I think the hats also were a blessing when he got himself lost for a few minutes. He found a parent with kids (like we’ve trained the kids to do), and they were talking to a Cast Member when we located him. 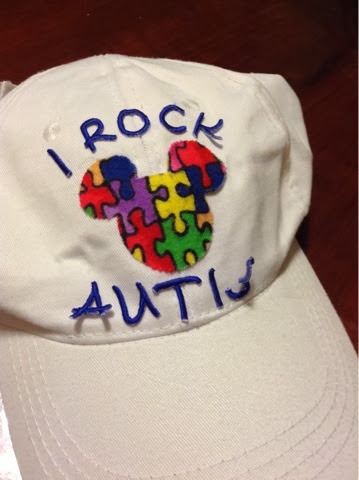 The hat let the Cast Member and kind parent know we had some special needs going on. The hats of course got dirty, and we lost one of the letters I hadn’t ironed down enough. When we got home I washed them in a sweater bag (the mesh kind that sometimes they hold nylons and other things too). I figured if any more letters came off in the wash, they would end up in the bag. See the clean, but damaged hat? 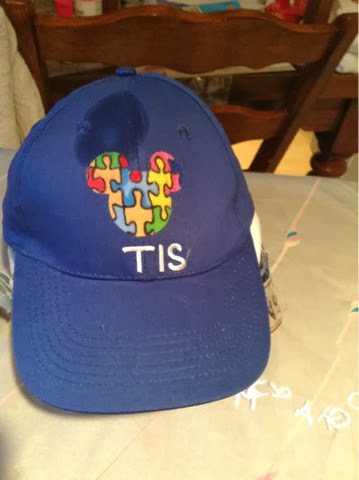 I then ironed the letters back on to the hat, and they look as good as new! I’m happy this worked out so well. I think we’ll be using these for a long time. Update July 2017 We’ve definitely used these hats a lot. The painters cap was lost pretty quickly, but the baseball caps are distinctive enough we’ve been able to find them again when we’ve lost them. They still help us get more smiles and patience. The older kids (who are now teenagers) have been testing and pushing themselves and so they rarely have meltdowns in public anymore. They have also pushed themselves to wait patiently in lines for about 45 minutes, so they don’t really use the hats. That is huge progress for us. Acroboy still uses the hats and it’s a good thing. He is almost six years younger than Lawboy and it is reflected in his behavior. While he is also pushing himself to do more, he is younger and has lower limits/thresholds than his older siblings.